American diplomats have been pushing for Bruson’s release, saying that he is basically on trial for his faith, not for any nefarious spying activities. When the negotiations failed, the Trump Administration surprised Turkey and the rest of the world by imposing economic sanctions against what most would consider to be an allied government—a fellow NATO member whose Incirlik air base was a crucial staging ground for the air war against the Islamic state. The sanctions were clearly the trigger event for the collapse of Turkish stocks and the Turkish lira, but some analysts say the country was long overdue for some kind of negative event in the Turkish economy for some time. In recent years, Turkey has been compared to Greece for having amassed one of the largest foreign debts in the world, as its banks and large companies have borrowed heavily to maintain activity in the economy. Foreign investment has dramatically slowed, in part because the country’s authoritarian government seems often inclined to meddle in monetary decisions. 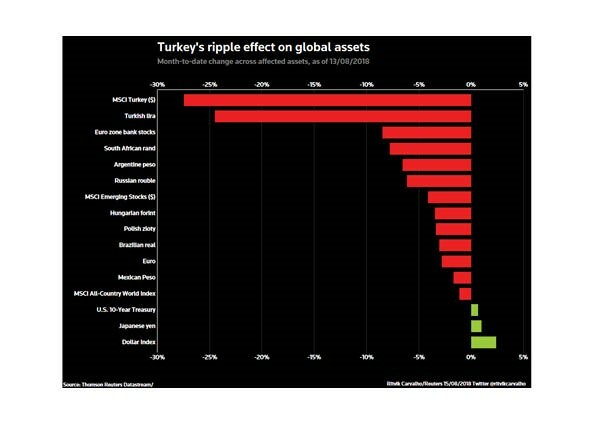 Those concerns were not exactly allayed when, in response to the crisis, Turkish president Recep Tayyip Erdogen squeezed central bank liquidity and doubled the interest rate cost in his country, in a single day, and then, by fiat, changed the rules so that speculators were no longer allowed to sell their for dollars or euros in what are known as currency swaps. Banks were forced to stop lending lira or renew any existing contracts. In addition, Erdogen lashed out by doubling Turkish import tariffs on passenger cars to 120% of their value, plus a 140% tariff on alcoholic drinks, and significant tariffs on tobacco, cosmetics, rice and even coal. In a subsequent speech, the Turkish president called for a citizen boycott of U.S. electronic products, including the iPhone.